We guarantee same day shipping for all orders placed Monday through Friday by 12:00 EST (noon) with the exceptions of holidays, severe weather conditions & other circumstances beyond our control. Orders placed over the weekend (Saturday & Sunday) will be not be shipped until the earliest business day. All orders will be shipped with no signature required. 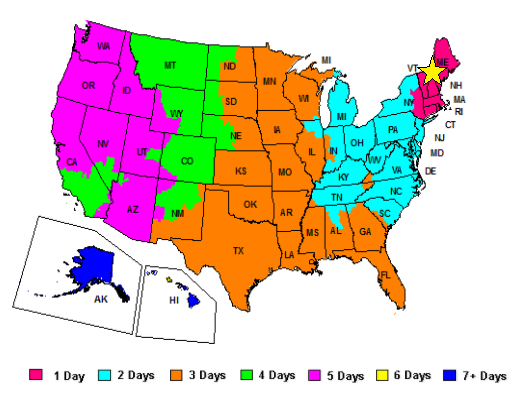 FedEx Ground/Home Delivery: Delivery time varies by destination (See map below). Business days are Monday through Saturday. Transit time estimates below do not include the day the order ships out. FedEx Saturday Delivery: If an order is placed after Thursday at 2pm EST and you desire Saturday Delivery, please place your order online selecting FedEx Priority Overnight as your shipping service. Then call us immediately to arrange for this upgrade. As it is not a typical business day, FedEx charges a $16.00 Saturday Delivery fee. Call HHI to arrange at 207-824-8501. 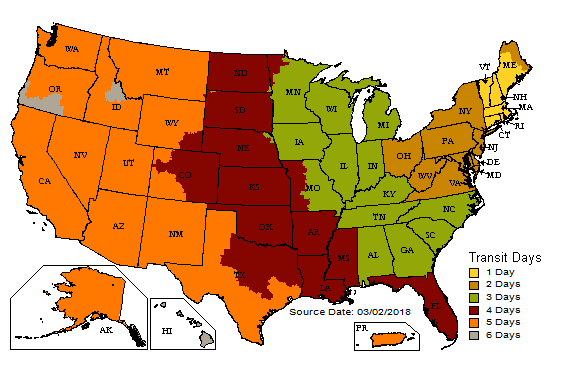 UPS Ground: Delivery time varies by destination. (See map below). Business days are Monday through Friday. Transit time estimates do not include the day the order ships out.